R.E.M. 's Peter Buck launched his solo career with the release of a self-titled album last year, and now he's set to expand his discography with a low-key release: a two-song 7-inch. It's due out on June 11 through Mississippi Records. The A-side is a cover of "You Must Fight to Live on the Planet of the Apes," which was originally penned by California garage-punk combo the Mummies back in the '90s. An announcement promises that this interpretation is "loose and raw," comparing it to Buck's contributions to the Replacements' iconic Let It Be. 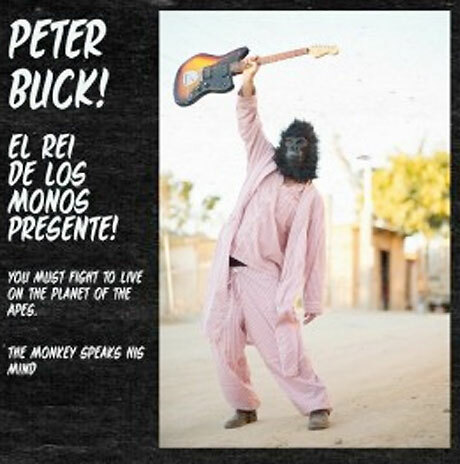 As for the B-side, the song is called "The Monkey Speaks His Mind," and it's said to be "a rollicking quasi political song keeping with the primate feel of things" Given that both songs have a monkey theme, it's only fitting that the artwork shows a guitar-wielding man in an ape mask. Buck has previously covered the Mummies tune during shows. Watch a version of the song below for a taste of what to expect from the single.